Eton Wick History: A Soldier Who Lived In Eton Wick Whose Name Is Not On The War Memorial. 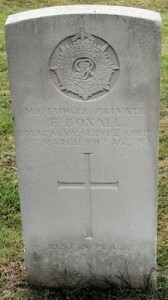 A Soldier Who Lived In Eton Wick Whose Name Is Not On The War Memorial. Frederick’s father, Robert Boxall, was a gardener from Kirdford, Sussex, born c1827. His mother Elizabeth was about 15 years younger. (Her maiden name was also Boxall which suggests she may have been a cousin.) Robert and Elizabeth had at least seven children; six boys – Charles Robert, William George, James Percy, Alfred Ernest, Frederick Albert, Jehu John – and a daughter, Florence. In the 1871 census they were living at Maybanks Lodge, Ewhurst; in 1881 at Meers Cottage, West Chiltington (where Frederick was born); and in 1891 they were at Pol Common, Pulborough. 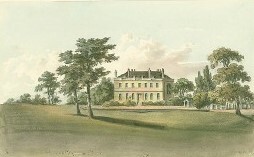 watercolour by John Hassell, c1822. By 1901, Frederick was working as a stable boy, living in rooms above the stables at Upper Gatton in Surrey. He was one of four young men living there; the others were a coachman, a carriage groom, and another stable helper. Gatton was a small parish, north-east of Reigate; half of it was taken up by the 550-acre Gatton Park Estate. Upper Gatton was owned by Alfred Benson, a director of J W Benson Ltd, a firm of jewellers, watch and clock-makers, based in London’s West End. By the time of the 1911 census, Frederick was living in Brighton. He listed his occupation as coachman/chauffeur, rough-rider, and domestic odd job man. (A rough rider is usually a rodeo rider, or someone who breaks horses, riding without a saddle. Perhaps he learned this skill while he was at Gatton?) Sir Jeremiah Colman had a cousin, also Jeremiah Colman, in Hove, Brighton. It’s not known if Frederick found a job in the area through his contacts at Gatton. Frederick was living in four rooms at 271 Eastern Road, Kemptown, Brighton (since demolished). 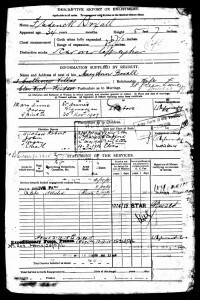 The 1911 census recorded him with a wife and child. He had married a Devonshire girl, Mary Ann Davey from Dalwood, in November 1907 at St Anne’s church, Pontypridd, Glamorgan, Wales. Frederick and Mary Ann went on to have four children in total; Robert, born in Brighton c1909, May also born in Brighton in 1911; John born in Stafford in 1913, and Ethel whose birth was registered in Eton in 1916. The birthplaces of these children suggest the family was moving around, perhaps following Frederick’s work. When Frederick enlisted in October 1915, he gave his address as 1 Castleview Villas, Eton Wick. He was 34 and working as a chauffeur. The army made good use of his driving skills and he became Private, M2/130622, a driver in the mechanical transport section of the Army Service Corps, part of 569 Company, a Motor Ambulance Company. His service records describe him as 5’7” tall, weighing just under 10 stones, with a chest measurement of 37½” fully expanded, 34” at rest. Sometime after Frederick joined up in October 1915, Mary Ann and the children moved to Datchet, to 28 Green Lane. There were other Boxalls, Matthew and Clara and family, living in the village at Green Lane in the 1891 and 1901 census and at the Parish Council Office in 1911. It is very possible they were related to Mary Ann and Frederick but this hasn’t yet been confirmed. Two of Matthew and Clara’s sons also fought in WWI. It wasn’t long before Frederick was promoted to Sergeant but after six months in France, in mid-April 1916, he became ill with typhoid. He was brought back to the UK and treated at various hospitals: University War Hospital, Southampton; Addington Park War Hospital, Croydon; The Enteric Depot, Woldingham; and then tested monthly at Catterick and Southport. Eventually he was well enough to come home to Datchet on leave in February 1917. Sadly, he contracted pneumonia while he was here. He died in a military hospital in Wiltshire on 1 March 1917. "Frederick was buried in Datchet. The Windsor & Eton Express reported on 10 March 1917: “We regret to record the death of Sergt F Boxall, ASC, which took place at Tidworth, from pneumonia. The deceased, who was formerly a chauffeur joined the ASC in October 1915, and almost immediately was sent to France. Last May  he was taken ill with typhoid and was brought to England. Eventually he got better and about a month ago came home on leave before again going back. The Saturday previous to his departure he contracted pneumonia, from which he never recovered. His promotion took place only a short time prior to his illness. He leaves a wife and four young children, to whom the greatest of sympathy is extended. The funeral took place on Wednesday afternoon last and was witnessed by many sympathisers. A party from the Coldstream Guards met the funeral cortege at the house, and the drums and fifes played farewell music. At the conclusion of the service three volleys were fired, and the ‘Last Post’ sounded. The Rev J H Harvey, M A officiated and Mr G Hunt had charge of the arrangements. The mourners included: Mrs Boxall (widow), Mrs Boxall (mother), Messers E., W., and P [Ernest, William and Percy] Boxall, brothers, and others and there were many floral tributes." Frederick was awarded the British War Medal, Victory Medal and 15 Star. His wife was awarded a pension of 28/9 per week for herself and her four children. Datchet Village Society. who undertook the research. Further information about the men who are remembered on the Datchet War Memorial can be found on Datchet in WW1. Frederick Boxall: The Commonwealth War Graves Commission page. Frederick Boxall: The For King & Country page. Frederick Boxall: Lives of the First World War page. The Datchet War Memorial page on Buckinghamshire Remembers website.